Let's look at the market's performance on 7th April, 2019. GoDaddy had the top sale of the day for two days in a row, this time it was Sciencentral.comwhich sold for $10,250. NameBio recorded 284 sales $100+ for a total of $132,498 with an average sale price of $467. Compared to the previous day there was a decrease of 2% in the number of sales but the total dollar amount increased by 9%. We also recorded an additional 1,343 sales below $100 for a total of $31,455. The domain HEGY.com sold for $1,725 at GoDaddy for an increase of 551%. It last sold for $265 on July 1st, 2010 at Sedo. The domain Verra.com sold for $4,576 at GoDaddy for an increase of 397%. It last sold for $921 on April 11th, 2010 at NameJet. The domain CameraBundles.com sold for $215 at GoDaddy for a decrease of 82%. It last sold for $1,194 on January 13th, 2016 at BuyDomains. The domain Courier24.com sold for $370 at DropCatch for a decrease of 89%. It last sold for $3,325 on January 23rd, 2013 at Sedo. 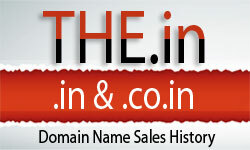 The domain OurFutureToday.com sold for $155 at GoDaddy for a decrease of 93%. It last sold for $2,088 on July 19th, 2017 at BuyDomains.